The information processing demands of many of today's businesses long ago outgrew the legacy relational database management system (RDBMS) software. The Web's explosive growth has only amplified the need for businesses to manage increasingly large volumes of data - data that must be made available across a distributed (geographically or otherwise) system and does not fit neatly into a relational data model. 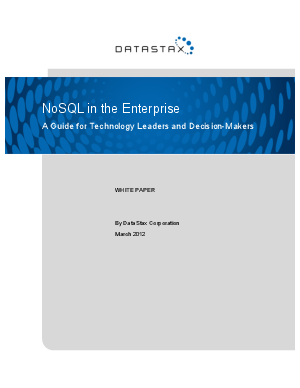 This paper will enable those implementing a NoSQL strategy to make more informed decisions when (1) choosing a particular set of NoSQL software, and (2) deciding which vendors to target.